UK second class signed for is £3. This is not always possible. Manufactured by BBM (?). and assayed in London in 1978 (date letter D). The stone is 2 cm high by 1.5 cm wide by 0.7 cm deep (at the deepest point), the gallery / mount is 1.3 cm high from corner to the ring interior, the overall height of the stone plus gallery (to ring interior) is 1.4 cm. 10mm at the deepest point. , All our silver is Genuine silver and not to be confused with cheaper alternatives. Ring size M 1/2. Golden orange amber gem set, rose gold ring. The amber is held in place by 2, V shaped, rose gold claws and encircled in a textured and openwork rose gold setting. Warm feel and look that will flatter the hand. A marquise shaped, deep red garnet has been bezel set at the center of this large piece giving it a warm glow. 20mm at the deepest point, shaped to reflect the marquise garnet. Gorgeous sparking blue druzy agate. Almost a midnight blue. Bezel set into. 925 sterling silver. A stunning collaboration of vines and leaves looked to be growing around the setting. The druzy is 10 mm. A beautiful oval Morenci Turquoise cabochon set into. 925 sterling silver, and surrounded by a very decorative, unique design. The cabochon itself is 15 mm x 10 mm. A stunning turquoise blue with silver and bronze matrix. Top quality 100% Genuine Blue Topaz Gemstone surrounded by a halo of real natural Diamonds mounted on a beautiful. 925 Sterling Silver ring. Material: Certified. 925 Sterling Silver. Side Stones: Genuine Real Diamonds SI Clarity, Color G-H.
Never has a gemstone been allowed to display this much vibrant color as this setting has allowed. The estate ring was made in the 1990s and is crafted of solid platinum and weighs a hefty 10.6 grams. The unique modernist design has an open shank for a unique design twist! Rose Quartz: 31 mm x 20 mm. Sterling Silver (tested and marked). All of our diamonds are genuine and none of our gold is plated (unless otherwise noted). A Shimmering Color Change Gemstone Sterling Silver Rainbow Labradorite Ring. This ring is signed 925 and guaranteed sterling silver. The ring fits a size 6 on our jeweler's ring mandrel and measures 13mm top to bottom (1/2") on the face and 7mm in the rear of the band. The openwork filigree band graduates front to rear like a cigar band. The oval cabochon stone is 8mm top to bottom. The stone is a different color depending on the light and angle. The ring weighs 6.4 grams on our scale. 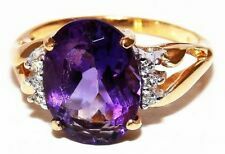 The condition is overall good with no chips or cracks to the stones and we have not cleaned or polished the ring since we bought it. Please contact me with any questions or concerns about the items condition, dimensions, shipping, bulk discounts or returns. Round Shape. Stunning Design. Stone:CZ Size:7. Sterling Silver and 14K. STER 14K Rug-----t's. Band: 0.6” wide. Ring Size: 6.75. The thickness of the gold must be a hefty 2.5 microns. Zircon is an important gemstone of many colors, and is an historical gemstone used for thousands of years. It's not anything like a cubic zirconia. Malgache Neon Apatite is a blue variety of A patite, featuring a very intense neon hue of color. Apatite is a stone that is frequently confused for other stones, and this variety is known for its strong resemblance to Paraiba Tourmaline. Alexandrite: 4 @ 2mm approx. 0.12 carats. Minor abstractions to surface of tanzanite, see pictures. Only view-able under magnification. Ready to wear. 14k Gold (marked and tested). This fantastic ring is super luxe -- an instant favorite and sure to be a conversation starter! Minor abstractions to surface of tanzanite, see pictures. Only view-able under magnification. Ready to wear. 14k Gold (marked and tested). This fantastic ring is super luxe -- an instant favorite and sure to be a conversation starter! Halo Settings. Stackable & Rolling Bands. 0.90ct Malachite Gemstone Right-Hand Flower Ring in 14k Yellow Gold. The featured ring is cast in 14k yellow gold and showcases a twist-design band topped by a malachite set on a 4-petal flower setting. The ring features more diamond accents set into the squared shoulders of the ring for a great modern look. 10k White Gold (marked and tested). Topaz : 9 mm = approx. All of our diamonds are genuine and none of our gold is plated (unless otherwise noted). The gems include 2 deep red garnets and a bright red garnet, which contrast the yellow gold their set within as well as the lustrous pearl. 10k Yellow Gold (tested). Garnet: 2 - 3mm = approx 0.28 carats. The gold is artfully crafted to resemble a blossoming sunflower. A perfect ring for spring! 14k Rose Gold (marked and tested). Turquoise: 13mm. Band Width: 2mm. All of our diamonds are genuine and none of our gold is plated (unless otherwise noted). A modern sterling silver 4.25 carat Blue Lace Agate cabochon ring featuring a floating design. 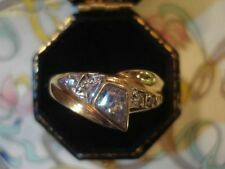 Ring is size 7 and resizeable. Stamped "Silver". ​Type: Blue Lace Agate Ring. Hallmark: Silver. Other: Free gift box included. Unmarked; XRF tested as 70% silver, 20% palladium. Opal: 7.7 mm x 6.6 mm. Sterling Silver and Palldium (tested). All of our diamonds are genuine and none of our gold is plated (unless otherwise noted). 14k Rose Gold (marked and tested). All of our diamonds are genuine and none of our gold is plated (unless otherwise noted). Size 6.25 (sizable). The beautiful contrast between the yellow and purple create a beautiful accent to any outfit. 14k Yellow Gold (marked and tested). All of our diamonds are genuine and none of our gold is plated (unless otherwise noted). This unique piece features one natural oval alexandrite at the center weighing 1.3 carats. The ring is a size 7.75. It weighs 3.3 grams. Caribbean Quartz Split Ring (sz 8) Platinum/Brass TGW 2.90 cts. Increases Order and Organization. 07/18 bag 19 black eb m. The blue gift box is included. Halo Settings. Solitaire Rings. Stackable & Rolling Bands. The featured ring is cast in 14k white gold and showcases an oval cut lab-created blue sapphire set at the center of an antique-inspired design accentuated with round cut diamonds on pave settings. Halo Settings. Stackable & Rolling Bands. Luck Charm Rings. The featured ring is cast in 14k yellow gold and showcases a twist-design band topped by a black onyx set on a 4-petal flower setting. 0.53ct Black Onyx Right-Hand Flower Ring in 14k Yellow Gold. An assembled gemstone, Midnight Fuchsia Quartz displays the organic beauty of Mother Nature. This colorful triplet stone is loved by everyone who desires to embrace natural color. A triplet combines three layers of material. 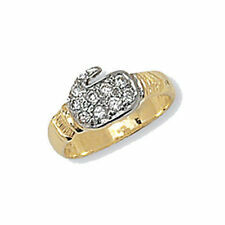 This beautiful ring is part of a exclusive collection of finest quality crafted Fashion Jewelry. It comes in various colors. The stones are gold color surround it with pearls and its gold plating. Adjustable sizing. Top of ring size is 37x29 mm. These are beautiful, elegant and will surely galvanized you, because they are unique comfortable fashion-forward and very popular for the rich look. Base metals of these products is Alloy mixing of copper and brass. Thanks for visiting!!! Happy shopping!! JEWELRY CARE: *protect from scratches and extreme temperatures *Avoid contact with perfume sprays chemicals and water. * Keep your jewelry in clean, dry and airtight box. *Wipe it using a soft cloth regularly. Bypass, Knot, & Loop Rings. Halo Settings. Eternity Rings. Solitaire Rings. Stackable & Rolling Bands. The featured ring is cast in 18k white gold and showcases a large flower set with a round cut diamond at the center petaled by pear-shaped sapphire gems and a smaller flower set with round brilliant cut diamonds. 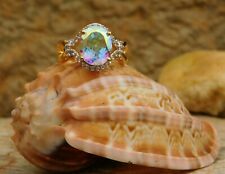 The opal is a bright while with beautiful flashes of blues, purples and greens. This unique piece would make a perfect gift for anyone who loves natural stones, opals, or sterling silver jewelry. Sterling Silver (tested and marked). 18K YELLOW GOLD STERLING SILVER 3ct GENUINE. This beautiful ring is part of a exclusive collection of finest quality crafted Fashion Jewelry. It comes in various colors. The stones are Clear CZ surround it by pink/ fusia CZ and its gold plating. Adjustable sizing. Top part of the ring size is 32x32mm. These are beautiful, elegant and will surely galvanized you, because they are unique comfortable fashion-forward and very popular for the rich look. Base metals of these products is Alloy mixing of copper and brass. Thanks for visiting!!! Happy shopping!! JEWELRY CARE: *protect from scratches and extreme temperatures *Avoid contact with perfume sprays chemicals and water. * Keep your jewelry in clean, dry and airtight box. *Wipe it using a soft cloth regularly.